RHYS BOWEN: Today I'm delighted to host a good friend, Kate Carlisle. 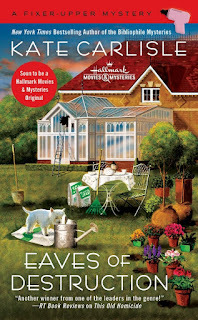 I'm sure she needs no introduction to those of us who love cozier mysteries. Kate and I share a publisher and an agent and seem to wind up doing events together, so I thought it would be a great idea to have her on Jungle Red with her suggestions for holiday gifts. How is it that the holidays—dates fixed well in advance—always manage to sneak up on me?! I've had a deadline looming, which is always a good excuse for neglecting to pay attention to every other date on the calendar. Yet somehow, despite my inattention, Christmas is right around the corner. And as my Jewish friends know, Hanukkah is already upon us. 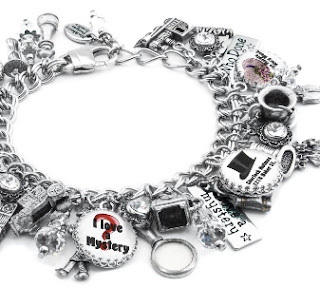 In case you're scrambling like I am, I present you with a few Gift Ideas for Mystery Lovers. Or if there's something on this list that you'd like to unwrap, share this post with someone who might be looking for gift ideas for you. Etsy is a great website for getting clever gifts you can't find anywhere else. One word of caution, though: if you're intent on committing a crime, this bracelet will give you away every time. It's going to be a little jingly. 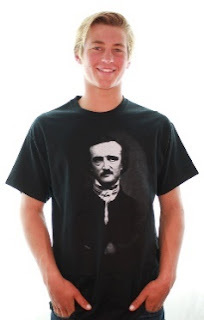 This T-shirt featuring the late, great Edgar Allan Poe would be a conversation starter, for sure—which could be a bad thing, if people keep interrupting you while you're trying to read! 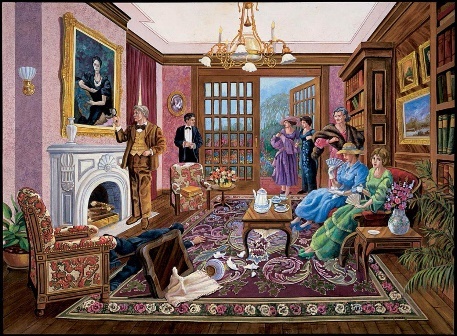 A story and a jigsaw puzzle that helps you solve the crime—fun for a couple to do together! 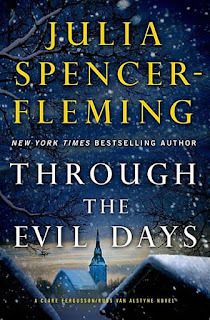 A Mystery Novel—or two—or three—or more! What a great gift books are—hours of entertainment in a convenient little package! If you've missed one or more of these books, then let your loved ones know which titles so they can get you something you really want. And be sure to check out all the other books by the Jungle Red Writers. Contractor Shannon is in high demand among rival homeowners, who will do anything to win Best in Show. One-upmanship and even espionage break out among neighbors. When a body is discovered at one of her home sites, Shannon must nail down the details and build a case against the killer before the door shuts on someone else—for good. Lindsey Norris and her staff are gearing up for the Briar Creek Library’s annual Dinner in the Stacks fund-raiser. 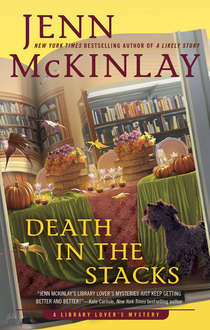 But the night of the fund-raiser, Lindsey finds Paula, one of her employees, crouched over the villainous library board president's dead body. As the plot thickens, Lindsey must catch the real killer before the book closes on Paula’s future . 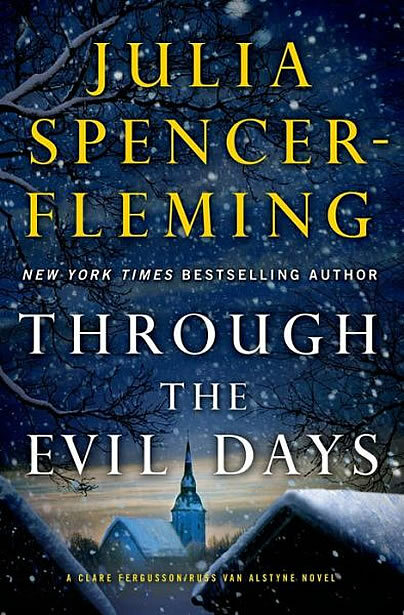 . .
A middle-of-the-night call wakes Episcopal priest Clare Fergusson and her husband, Police Chief Russ van Alstyne: a farmhouse has erupted in flames, killing the couple sleeping indoors – and their eight-year-old foster child, Mikayla, has disappeared from the wreckage without a trace. A recent transplant recipient, Mikayla will sicken and die without proper medication. Can anyone unpick the trail that leads to Mikayla before her days come to an end? Wishing you peace, love, and lots of time to read this holiday season! What books are on your wish list this year? Are you giving books, as well? These are marvelous gift ideas, Kate. That puzzle makes me think of Clue, my all-time favorite game [that would also make a good gift for the mystery fans]. Me, I’ll take any book anyone wants to tuck under the tree for me . . . . I *loooove* how many books you're gifting, Joan. A true family of readers. Kate, these are great mystery-related gift ideas. Our family used to work on a challenging jigsaw puzzle during the Christmas holidays, but we never chose a mystery-themed puzzle. There are way too many books on my wish list. But as mentioned in an earlier post, I am a huge Robert Crais fan (i.e. a Craisie), so THE WANTED (the newest Elvis Cole/Joe Pike book) is top on my list. So funny—I’ve never heard “Craisie”—love that! It's a real fan club, Hank! I met several Craisie members at Bouchercon 2011 when Robert Crais was the American Guest of Honor. I'll send good thoughts that you get THE WANTED! What great gift suggestions. Especially the books. This year, I want to concentrate on my TBR before I ask for more, but I'm still looking for the perfect WWII book for hubs. Preferably something to do with aviation. Are you looking for fiction or nonfiction, Kait? Maybe someone will have a great recommendation. Either, his mother was a WAC - I love finding books either about those first women fliers or fictional stories that fill in the blanks of what could have been. I missed an A in there - WAAC - She's shaking her finger at me! I gave books to the three kids I bought for. Otherwise, really not giving out anything and I'm not expecting to receive any books. Lovely suggestions. I just bought Bird by Bird by Anne Lamott and Stephen King's On Writing for my older son! He works in databases but took a creative writing class last year and has been writing articles for a magazine, too. He writes very nicely, and I want to encourage this side of him. Oh, what a lovely way to show your support! Your son is a lucky man. This is all such fun—have you seen the socks that are printed like the circulation cards in the back of library books? So cute! I'll have to look for those. I got Herself some socks: on the bottom of one it says "if you can read this" and on the other "bring me some wine." For my 12-year old grandson, and my new 13-year old step grandson, I bought socks that say "Adult in training". From our local bookstore, Joseph Beth, of course. I gave some of those to my almost daughter-in-law! OMG, WANT!!! That sounds adorable. I have those socks in yellow already. But this year when I purchased from the company, they offered me a mixed-match pair (one green, one red) for the holidays. I couldn't resist. Yes, I saw those socks advertised in a Mystery Scene magazine article - so cute, indeed, esp. for those of us old enough to remember library book circulation cards, lol. LOL Good point, Grace. Kids might not get it. Another lovely shop for literary lovers is StoriArts on Etsy. They do scarves, fingerless gloves and pillow covers with art and text from all the greats - including Poe and Sherlock Holmes! That's a great suggestion, Julia! Great suggestions! 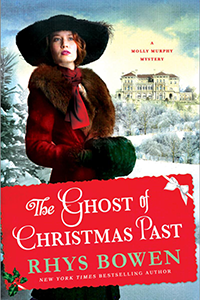 I love the jacket copy on that Molly Murphy book. I ususally buy the books I want immediately, so it's hard to have a list for the holidays. But I wouldn't cry if a copy of DANGEROUS TO KNOW showed up under my tree. That's the problem in our house, too, Mary. When we see a book we want, we buy it immediately. But we do try to look for books that the other may not have discovered yet. My grandson is getting Tarzan of the Apes, by Edgar Rice Burroughs. And my husband was captivated by Diana Nyad's swims, so he is getting her book, Find a Way. We exchanged family gifts at Thanksgiving, so these guys are the last ones to get presents from me. And neither of them will be giving me anything, I suspect. My husband only buys presents when one of the girls physically drags him to a store, and none of them will be here before Christmas. And that's okay. I'm trying to reduce our pile of belongings. The best gift would be help doing that! Tarzan of the Apes.... that would be a great classic to feature in the Bibliophile Mysteries! Putting it on my list for books Brooklyn might restore. I could have a lot of fun with that one. Hi, Kate! Thanks for including DEATH IN THE STACKS - such fabulous company to be in :) I love the puzzle gift idea but the Poe shirt is pretty rad, too. Happy Holidays! If you are looking for the perfect book for a writer or a reader, which includes all of us here, I highly recommend THE ELEMENTS OF ELOQUENCE by Mark Forsyth. I read this sometime in the past year, and now, every time I read anything or hear a speech or persuasive conversation I realize the intrinsic value of rhetoric. This came to me most recently last nigh as I listened to a Kennedy speech on "The Crown." Thank you so much for the recommendation, Ann. That sounds lovely. I'll check it out. I give my aunt books every year. And my wish list is more books than anything else this year. Unfortunately, I don't know when I will get them read, so I'm adding time to read to my Christmas list. Not sure that is going to happen, however. Time to read is at the top of my list, too. Unfortunately, it's not something anyone else can give to me; it's something I must give myself by being better organized. I wish you luck! So glad I stopped by this morning! I love Kate Carlisle's books. All of the gift ideas look great! Love the idea of giving books as Christmas gifts. Love receiving books as Christmas gifts. People in Iceland give books as gifts on Christmas Eve. Is today St. Lucia's Day, a Scandinavian tradition where the eldest daughter serves pancakes in the morning? Thank you for loving my books, Diana! I don't know the answer about St. Lucia's Day. That's such a specific tradition. LOL I do love the Icelandic custom of giving books on Christmas Eve. Such a cozy way to spend the evening, the whole family reading. There was someone in Jungle Reds who knew about St. Lucia's Day. I cannot recall off the top of my head. The Icelandic custom of giving books is such a cozy way to spend the evening with the whole family reading. You are welcome. I love the bookbinder series. I remember seeing someone give a demonstration of bookbinding at a book festival in San Francisco when I was in college. And thank you again for the Fixer Upper swag that you gave me at Bouchercon. Love the pink measuring tape. My son has been in visiting for a few days, and we went Christmas book shopping at Barnes and Noble yesterday. He is quite a deep thinker, and his choices were quite serious--Rights of Man by Thomas Paine; Crime and Punishment by Dostoevsky; Notes from Underground, The Double, and Other Stories by Dostoevsky; and Win Biggly: Persuasion in a World Where Facts Don't Matter by Scott Adams. I purchased books for my Christmas Bag of Books that sits under the tree each Christmas. Those books included The Saboteur by Andrew Gross, The Library at the Edge of the World by Felicity Hayes-McCoy, The Keeper of Lost Things by Ruth Hogan, The Things They Carried by Tim O'Brien (already have a paperback, but this one is a signed hardback), and Black Rabbit Hall by Eve Chase (read earlier this year and loved so much, but I didn't have my own copy). There are still books on my Christmas Bag list. I know that I'm getting my daughter a book called Trials of the Earth: The True Story of a Pioneer Woman by Mary Mann Hamilton, and my son-in-law will receive The Death and Life of the Great Lakes by Dan Egan. They will probably be receiving at least one other book. The granddaughters and my husband will be receiving books as well. Kate, I love the bracelet and will be looking that item up. I have a pair of gargoyle bookends for my son, as his ex-girlfriend of five years absconded with the ones I had previously given him. I found a pair of goat bookends for me. I've got my eye on a Kindle cover for my daughter. I have so much fun looking through all the book related items on Etsy and other sites. I think I know what I'll be doing this afternoon. I could've sworn I posted a response earlier this morning to this blog post. But now it seems to have disappeared, just like yesterday. What the heck? I gave books to the three kids I buy for. I don't have any books on my wishlist as I won't be partaking in much gift giving/receiving other than the kids mentioned. I just buy the books I want when I want/can afford them. Computers are a mystery, Jay. I'm glad this comment stayed! I work off wish lists on Amazon or B&N for book people, but most of the time those people, especially my wife, have reserved the newest book by favorite authors (Val McDermid, Louise Penny, John Connelly and so on) at the library months before they are published, so she doesn't want me to buy them. I have to scour Mystery Scene magazine and other sources (including here, of course) to find book gifts. She makes quilts, but already has dozens of quilt books. It's hard. This year she'll get a new umbrella and a gift certificate. Both my nephews are into history, so they have many titles they want. One of them is getting the new biography of Grant. 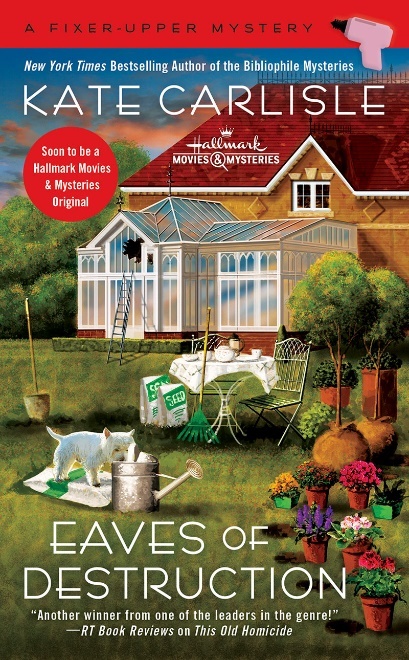 For myself, the latest MX book of Holmes stories is always a must. I know some quilters, and one thing they always love is a gift certificate to a quilt fabric shop! :) Tell your wife there's a free quilt pattern in the Secret Room at KateCarlisle.com. It's for a Bibliophile Table Runner, and it's charming.